Last week at IntegratED in Portland (a conference filled with crazy-inspiring people, blog post on that coming soon), I had the chance to facilitate a session about developing digital learning communities using Google+. So, how can a digital learning space like a Google+ community help support these ideals? The goals of the participants were varied. Some wanted to join pre-established Google+ communities to grow professionally. Others wanted to set up their own communities to promote sharing among their local colleagues and beyond. We then considered some key questions when both searching for communities to join and creating new spaces. Two years ago I started the Instructional Technology Integrators and Coaches community, with the intent of finding support among other educators in the technology specialist/coaching roles as I transitioned to a new position in my district. Full disclosure: I created this community out of pure selfishness. I wanted to surround myself with people that were smarter and more resourceful than me to support my work in schools. Now, with over 3,500 members (and yes, I realize they’re not all contributing members), the community has blossomed into an active space where educators can pose questions, share resources, provide feedback, and search through archived conversations on topics ranging from collaborative learning activities to account management to digital citizenship to best practices in a 1:1 classroom. It is a place I like to be. I enjoy reading each and every post and the responses that follow. Moderating duties do not exhaust or irritate me. (Although as more members joined, I did seek help moderating- thankful for Doug and Susan who also devote their time to this community!) Which brings me to more questions to consider. From the beginning, I did not want this community to become a place where people simply linked to their blog posts or shared their edu-events or plugged their stuff without engaging other members of the community. Do people occasionally do this? Yes, they do. I miss the boat sometimes and maybe should remove more promotional posts than I do. But if a post is flagged as spam, even from a reputable educator, it’s usually because the post was shared out among several communities. And, if there was no other content added to the post aside from the link, I typically choose not to post it in our community. All members have to be approved before they can post. I look at the profile of each member who requests to join, searching for some sign of an educational affiliation. I don’t approve requests from companies or vendors, even those with an edtech focus. I block people who take advantage of their memberships, and remind people of our community’s purpose via comments on their posts and in posts I write. In a digital learning community, just as in a real time, face-to-face community, purpose matters. Intent matters. Etiquette matters. Respect matters. Members in our community freely give their time, ideas, and feedback to others. They deserve to learn in a space that honors what they give as professionals. To make the most of your experience in a Google+ community, find (or create) a community that has a clear purpose, is well organized, has moderators that help make the learning experience streamlined and meaningful, promotes opportunities for discussions, has a variety of resources shared around the common purpose, displays evidence of respectful participation and engagement among a diverse membership, and openly accepts and encourages members’ critical questions, thoughts, and ideas. Google+ communities as well as Hangouts and other community tools can help create spaces for “intellectual collisions” that can promote sharing and innovation in your organization. But the success of this type of community has little to do with the technological aspects of the shared space and much more so with the people involved. While Google announced earlier this week that Google+ was undergoing some changes, I don’t believe Communities will be leaving us anytime soon. But, even if they do, I know there are a band of people who will come along with me to whatever space we inhabit next. Find yourself some good people. I am thankful each and every day for the voices that contribute to our community. Here are my slides from the session and here’s the link to the page where participants accessed resources. 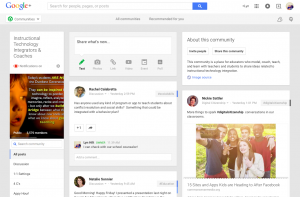 How are you using Google+ communities in your teaching, learning, and professional growth? Previous PostPrevious Do you let your kids use Google?